The post Are asiatic lilies poisonous to cats? appeared first on Asiatic Lilies. Asian Lily can be a source of cat poisoning. It can cause acute kidney failure. We can’t identify the exact substance that causes poisoning, but all parts of the plant should be considered poisonous. Internal damage occurs within the first 3 days of ingestion. Be careful with buying new plants. You can reduce the risk by carefully checking what are the safe plants for your animals (Check our article about dog poisoning). There isn’t a known antidote. Your first reaction should be visiting veterinary. Time is not on your side. The soonest as you get to the veterinary – the better. In the past, there were cases when in the early stages, activated charcoal was helpful with decontamination. When taking your cat for treatment don’t forget to take a sample of an ingested plant with you. It will speed up the process and help with diagnosis. If you’re not sure what plant was the one ingested – take samples of all suspected flowers. 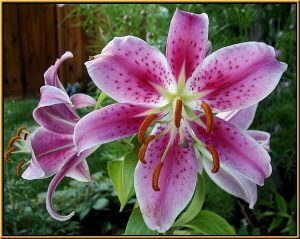 The post Are asiatic lilies poisonous to dogs ? appeared first on Asiatic Lilies. The post Basic information about Lilies appeared first on Asiatic Lilies. Lilies are one of the most beautiful bulbous plants that we enjoy in our gardens. Their incredible variety of colors, shape and construction of flower and inflorescence, make possible to distinguish a great number of varieties from this specimen. These flowers have enjoyed great popularity among all gardeners. Quite often we can also hear about the collectors of these plants, who in addition to the cultivation and care, are also involved in breeding and culling of new varieties. All this thanks to the beauty that emanates from lilies. If we want to have them in our garden, we need to understand the basic principles of growing conditions and care. Below I describe exactly how to handle the lilies. When choosing bulbs for planting lilies, we must be guided primarily by their appearance. They can not be soft, affected by rot or battered, as it increases the likelihood of total damage or an attack of various diseases. If you have already bought bulbs, we need to select the appropriate position. First of all, it must be a place sunny and warm. Well, it is sheltered from sudden gust of wind. The soil in which they feel best is the land fertile and humus, acidic with a pH of about 5.5. It should also be permeable, this location may not be water. Planting date depends on the variety conditions. Lilies, which overwinter in the soil, should be planted in late September and October. Other species dunk in the spring. Planting depth should be about 10 – 15 cm, depending on the size of the bulbs (further inserted into larger bulbs.) The exception here is lily white, which you dunk a depth of 5 – 10 cm. The spacing between each specimen should be approximately 15 – 20 cm. 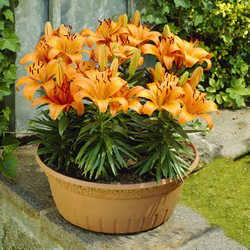 Lilies are plants that feel good when they are fertilized and watered regularly. We use a compound fertilizer. Water should be provided in such quantities that the earth was not too soaked, and at the same time that it is not too dry. Therefore, the cultivation of these flowers are important drainage and mulch (bark, garden compost or peat). Species lilies, which we leave for the winter in the ground, have coped well with the prevailing in our frosts. It is only important to plant them before the onset of cold weather. Dig them only every few years. Other varieties should rather pull up after flowering and dried on the plants every year. Bulbs stored in the dark, not too warm and not too humid room. Good for this purpose are the cellars, where there is too much humidity. ngal diseases and viral infections. The most common of these are gray mold, mildew and rot lily base of the shoots or bulbs, we fight using appropriate anti-fungal sprays, as well as mottle virus, tulip, cucumber mosaic virus and tobacco leaf curl virus necrotic, with whom it is impossible to fight, and attacked the plants need dig up and burn. Very often we find lilies pests that eat plant parts. The most common of these is poskrzypka lilac (red beetle with black legs; larva gray), thrips lily (dark brown insects), keel Lilian (mainly found in flower buds). With all the pests we deal with appropriate spraying. The main way to get young bulbs of these plants, while the one who gives the guarantee receipt progeny plants with the same characteristics as maternal flower, is the separation of adventitious bulbs. We do it when they dig and prepare for hibernation. Garden lilies are very beautiful flowers. Inflorescences of some varieties can be very large and can often produce several dozen flowers. Regardless of the variety, lilies are a great decoration for your garden, which is why it is useful to know the conditions of cultivation and care of these plants to be able to properly grow them in your garden. 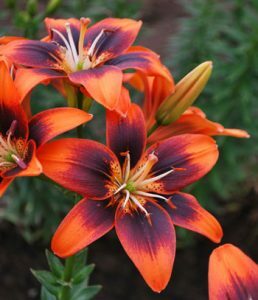 The post Fertilization: Asiatic Lilies appeared first on Asiatic Lilies. The post What to look for when buying asiatic lily bulbs appeared first on Asiatic Lilies. Before buying bulbs try to ask experienced breeders who will help you choose the varieties tested in their backyard. Bear in mind that the majority of Asian and Oriental hybrids from Holland are for acceleration in greenhouses, and not all seem to be good choice in the garden. Bulb should be firm, without the brown and black spots and indentations on the scales and roots. Must have a healthy and firm roots, if bulbs are dried with withered roots, before planting the bulbs, soak for 24 hours. in lukewarm water. We have to remove sick husks, and then dry it by putting “upside” to drain from between the scales. Position in full sun or partial shade and well ventilated. In extreme cases, just 5-6 hours of sunlight is enough. Lilies do not tolerate waterlogged soil and standing near the roots of water, land subsidence, which formed frost hollows. The best varieties can be planted in the rock gardens, pots. They can also be planted in the pails, buckets, containers and during flowering move on balconies, terraces. For example, buckets with a capacity of 10 liters can store 2-3 medium bulbs. If you plant lilies in front of buildings where is the sun, set a distance of 1.5-2.0 m from the wall, because the wall which is warming-up tilt at an angle up to 45 degrees and the inflorescence is unbalanced. The ideal place is the area of conifers, which are a good backdrop for the lilies and create a favorable microclimate. Soil must be humus, permeable water and air to the roots. To loamy soil we should add peat or coarse sand. 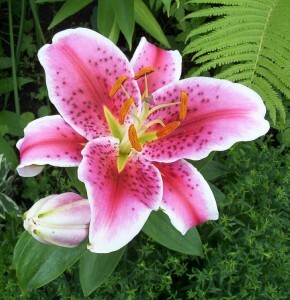 For hybrids of Asian lilies, soil should be slightly acidic with a pH of 5.5-6.5. The post Floriculture of lilies appeared first on Asiatic Lilies. The post Introduction to Asiatic Lilies appeared first on Asiatic Lilies. 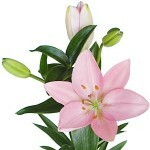 Lilies are perennials onion, and their exceptionally beautiful flowers of various colors grow throughout the summer. Asiatic lilies are the largest group of garden lilies, distinctive richness of shapes, colors and habit. They are characterized by a complete frost resistance and low susceptibility to disease. Asiatic lilies are now among the most popular garden hybrids. They are also recommended to people with no experience gardening. Asian lily flowers do not smell, usually have open, raised cups in the shape of little cup. Leaves narrow to broad, lance-shaped, glossy, green . Body underground is composed of imbricately onions stacked, scales are thick. To the group of Asian lilies among the following hybrids. Many of them come from Lilium bulbiferum and Panther (Lilium lancifolium son. Tigrinum). The post Asiatic lily bulbs appeared first on Asiatic Lilies. The post How to plant asiatic lilies appeared first on Asiatic Lilies. When to plant asiatic lilies? Usually we should plant lily bulbs in autumn, exactly between September and November. It’s great time to do this, because it’s mild outside, there is little wind and a few frosts. Also soils are warm which make it possible for roots to grow. All things considered, asiatic lily is the first to bloom and very easy to grow so be prepared in September ! How to plant and take care of lilies? 3) Plant only in areas where they could get about seven hours of sunshine a day, next to bigger plants to prevent bulbs from drying out. 6) Bulbs need space between each other to grow, so dig other holes in distance of about three bulbs. I hope these advices will help you to plant asiatic lilies as well as other kinds of lilies ( maybe oriental or calla lilies?). The post Deadheading of Asiatic Lilies appeared first on Asiatic Lilies. To get the most from your flowers (doesn’t really matter if they’re asiatic lilies or daylilies) you have to deadhead them and remove dead parts of your plant. 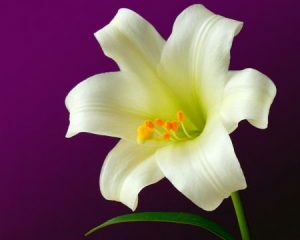 We need to take off bad parts of flowers as soon as they start to drop off, as we try to prevent lily from losing its energy. Deadheading protract life of flowers and enable them to produce more flowers to make your garden ever more beautiful !